Are you ready for even more bubble-popping blasts of fun? Head on back to Borb Bay in Bubble Town Quest, the sequel to the hugely popular match-3 arcade puzzle game, and go on an adventure you'll never forget! Maryann, Frank, Pearl, Sandy and the rest of the Borbs need your help to escape from the evil lumps and save Borb Bay! Use the cannon to match 3 or more of the same Borb, and clear all Borbs before they reach the danger zone. In Bubble Town Quest, you can choose to play in two styles, Journey and Endless. Journey allows you to progress through a map, while in Endless you'll test your skills through continuous play to reach the highest level you can. In both, you can alternate between Straight Up or Ball modes to give yourself an even greater challenge. What are you waiting for? 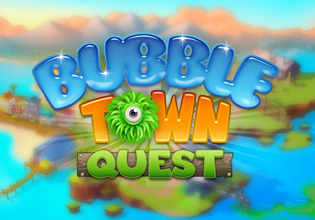 Begin your Bubble Town Quest now!